Nutritional management is important to the reproductive success of your heifers. A heifer that calves on time in her first and second calving season is more likely to keep a 365 day calving interval throughout her reproductive life. Typically, virgin heifers are bred at 14-15 months of age to achieve their first calving date at or around 24 months of age. Proper nutritional management from birth to first calving should be considered thoughtfully. While the dam (mother) of the heifer calf picks up much of the nutritional “slack” before weaning, nutritional management from the time of weaning through first breed up is entirely dependent on the producer’s competence as a manager. Sexual maturity (the start of cycling) of heifers is related to interactions between age, weight, and breed type. Obviously, reaching sexual maturity is required to achieve a successful virgin heifer breeding program. The heifers should weigh 65-70 percent of mature body weight when you begin your artificial insemination program. Specifically, British cattle should weigh at least 65 percent of mature body weight, and Brahman cross cattle should weigh at least 70 percent of mature body weight. What constitutes mature body weight? This is the weight of cows of the same genotype at 5 years of age in a body condition score of 5. Usually, the weight of your cows at weaning is useful in this determination. Below is an evaluation of developmental goals. Do not push heifers too hard. During the first three to 12 months of age, heifers are developing mammary glands in the udder which closely influences future milking ability. If you push heifers to gain more than 2 lb/hd/day during this time period, fat deposition in the udder may occur, negatively affecting the future milk production of that female. How do you start heifers correctly? Sound Nutrition! No best intentions, no great genetic base, no world-renown vaccination program, and no high-powered antibiotic can overcome the negative effects of poor nutrition. However, all of these important aspects of weaning healthy, high-performing calves can be enhanced when provided alongside a sound starting nutrition program. Why are healthy cattle more profitable? Primarily because they grow! Why do healthy cattle grow? Primarily because they eat! Think about this for a minute…if cattle don’t eat they get sick and sick cattle don’t eat. Cattle must begin eating quickly after weaning to be profitable short-term and long-term. Furthermore, what the cattle eat is of great importance. The creep ration is not the starting ration for your calves. Traditional creep rations don’t have the roughage level starting rations have. Traditional creep rations are designed to be supplements to milk and grass if consumed at an optimal level (1% of BW). The grass in the calf’s diet provides the much needed roughage for adequate rumen health and optimal performance. With creep feed, calves hit the feed bunk hard up front and then don’t come back the next day…their intake is “yo-yoing”. Because there is insufficient roughage in the creep ration, the calves experience acidosis and don’t feel like eating again until their rumen pH increases. Purina has a time-tested, traditional starting cattle feed in Precon® Complete. Precon® Complete adheres to the “rules of thumb” for a well-balanced starting ration and, better yet, newly weaned calves will “flat out” eat it. Usually, feeding Precon® Complete for 7-14 days is sufficient on ranch-raised cattle. Because Precon® Complete is so palatable, heavier cattle that have been creep fed (cattle that know how to eat) usually should not remain on Precon® Complete longer than 7-10 days. Feed efficiency may begin to decrease and some bloating may occur. In this case, Accuration® Starter should be considered. Accuration® Starter utilizes patented intake modifiers to change eating behavior, such that starting cattle eat smaller meals more often throughout the day. How do you grow heifers effectively? After getting off to a good start, recall your previously determined developmental goals? Then, use a nutritional program that achieves those goals economically. The most economical gain is put on with your greatest resource…your forage base. During the spring and early summer, pasture forage can sustain the 1.2-1.5 lb ADG typically needed for successful heifer development. Unfortunately, the forage conditions can change dramatically with changes in temperature, rainfall, and season. You need a low cost supplementation program when forage quality declines to the point that your developmental goals are not being met. With the rising costs of fuel, labor, and time, a self-fed supplemental program seems desirable. However, if the self-fed supplement consumption does not fluctuate with changes in forage quality, it is not working correctly. 1. Supplement is not needed for high-quality forages, however, mineral should be provided. Remember, determine the development goals, start the heifers off right, and then grow the heifers economically with as much of your forage as possible while maintaining development goals. It is best to have your first-calf heifers in a body condition score of 6 at calving. At least, have them in a body condition score of 5 at calving and moving on an upward plane of nutrition as you move into the breeding season. Why is body condition so important to monitor at calving and through the breeding season? The best way to answer this question is to investigate the relationship between body condition score and production parameters like pregnancy/weaning rate. The cow’s ability to cycle is of relatively low priority. The cow must be in good condition or gaining condition to begin cycling and then be bred on time. Houghton et al. (1990) illustrates the importance of good body condition score as it relates to post-partum interval and pregnancy rate (Figure 1; see below). Females that are in poor condition and/or in negative energy balance (losing weight and condition) during the breeding season have longer post-partum intervals and lower pregnancy rates. Notice that growth of a female is of relatively high importance in nutrient partitioning post-calving. First-calf heifers still have a growth requirement that must be met along with other requirements listed above. Because of this, first-calf heifers are usually much more difficult to breed back compared to more mature females. Essentially, first-calf heifers are more likely to have a nutrient requirement that is higher than nutrient intake from forage. To avoid this predicament, try to calve your females when forage-quality is the best and sufficiently available. With our recent drought history, this “best time of the year” is almost impossible to predict, but some generalities apply. Usually spring and early summer provide the best forage situation. However, fall-calving can be used successfully if high-quality, cool-season pastures (rye, oats, wheat, etc.) are available for grazing. Always set yourself up to get the most out of your greatest resource, that being your forage base. If you intend to calve your first-calf heifers sometime before your mature cows, make sure the forage situation dictates you making that decision. I don’t recommend you calving your first-calf heifers in January just because your mature cows calve in February. If your pastures don’t green up until February, then you should be calving your first-calf heifers in February. If you calve your heifers when forage conditions are horrible, they may get thinner before they get fatter. The information in the preceding table clearly indicates those body condition changes to be negative to your breed back. Sometimes, even when forage conditions are their best, nutrient requirements of heifers may not be met with that forage base. In these cases, supplemental nutrition is critical to a timely, successful breed back. However, the supplementation strategy you use should optimize your forage use. Furthermore, if you are going to supplement, you need to start at least 30 days before breeding season and carry through 30 days into the breeding season. Remember, we need the females on an upward plane of nutrition going into the breeding season. 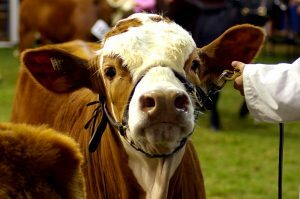 This entry was posted on Thursday, March 28th, 2019 at 10:31 am	and is filed under Cattle, News & Updates. You can follow any responses to this entry through the RSS 2.0 feed. Both comments and pings are currently closed.